The airlines have begun stuffing seatbacks with anti-general aviation propaganda, right next to the sick bags. AOPA has been anticipating such stealthy maneuvers as the FAA funding debate spools up. So far, editorials have appeared in two in-flight magazines, Northwest's NWA WorldTraveler and United Hemispheres, under the headline "Smart Skies," the namesake of the airlines' political initiative. Now I'll forever defend our freedoms of the press, it's the one thing that allows me the privilege to pound away via the Internets on issues that I feel need addressing. And yes, they are the airline's magazines, and like always, the guy who buys the ink gets to say what goes between the covers. [It is a] dramatic oversimplification to blame GA for all their woes, namely air traffic delays. "If only it were that simple," said AOPA President Phil Boyer. "At the top 10 busiest airports in the United States, the FAA's own data for all towered airports show that general aviation makes up less than 4 percent of all aircraft operations." A June 5 front-page story in USA Today said that about 40 percent of the delays were caused by weather. Other factors were late-arriving aircraft, maintenance and crew problems, and flight coordination at airports. The article also said that flight delays are at their worst in 13 years. This dogfight is starting to stink, as if some GOP gasbag was trying to steal the election by swiftboating his Dem opponent. So shoving this garbage in the faces of their paying customers as they sit crammed into coach seems pretty desperate to me. The airlines' trade organization, the Air Transport Association, has also started running ads on the CNN Airport Network, making the same claims. They were countered by the Alliance for Aviation Across America. As I read these reports about the airlines and ATA stepping up their propaganda campaign, it smells to me like their handlers must be sensing that “Big Mo” is turning against them up on The Hill. They won a recent Senate subcommittee decision by one lousy vote, the thinnest of all possible margins. They now are trying to turn America against GA, hoping they'll make a good enough case to incite fear in the hearts of the flying public so that they'll contact their representatives in D.C. and beg for them to smack down GA and save the poor airlines. But here is one big flaw in what the airlines are planning. See, every member of their ticket buying passengers knows someone who flies GA aircraft, or maybe has a pilot in their family. The GA community has roots that travel far into the very fabric of our Society, and in this instance, the airlines and ATA have completely blew this one, because we pilots are a very vocal bunch. We talk to everyone we meet about flying, and the topic these days is how the big bad airlines are trying to screw us to the floor to pad their pockets. 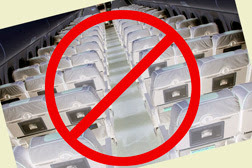 I suspect those seatback articles will piss off more people then they will convince. Don't buy what they are selling.